1Cover your work surface with several sheets of newspaper (to protect your case). Power down your PC, unplug it from its power source, and place it on top of the newspaper. 3Touch the metal chassis of your case to dissipate any static electricity on your body. An electrical charge can send your new RAM modules to Frisco — permanently. 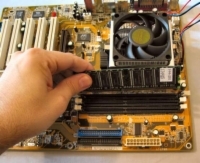 Check the motherboard manual, which should have a schematic diagram that helps you locate the slots. Typically, the RAM modules are found close to the CPU, in the center or in one corner of the motherboard. 5Turn your PC’s chassis so that the DIMM slots are facing you and make sure that the two levers on the side of the socket are extended. 6Align the connector on the bottom of the module with the socket and push down with light pressure to seat the module. While you push down, the levers on each side of the socket should move toward the center, until they click in place. After you correctly install the module, the two levers should be tightly flush against the sides of the memory module to hold it securely. 7Slide the cover back on your PC and secure it. Move your PC back to its place of honor and plug it in. Restart your computer and prepare to enjoy a faster PC!